Our initial plans included going to one park a day. We made it to the park yesterday. It is not easy to get two one-year-old’s out and about at the same time, but also Mae has been a bit under the weather since arriving. She is still a trooper though and really tries to be part every activity. We are enjoying each other’s (sometimes whiny) company nevertheless. (Picture of Julie’s Bee Sting cake to come in a later post). Mae and Henry play in the wooden train at the park. Henry being his vocal self. Jacqui cuddles with Henry and Mae. Jacqui, Mae, Juj and Henry wait for the Bee Sting cake. Mae and Henry play by the window. Cousin Mae and Aunt Julie arrived in New York yesterday afternoon. We are excited to have them here for a long weekend. Henry and Mae got reacquainted by taking a splash bath. 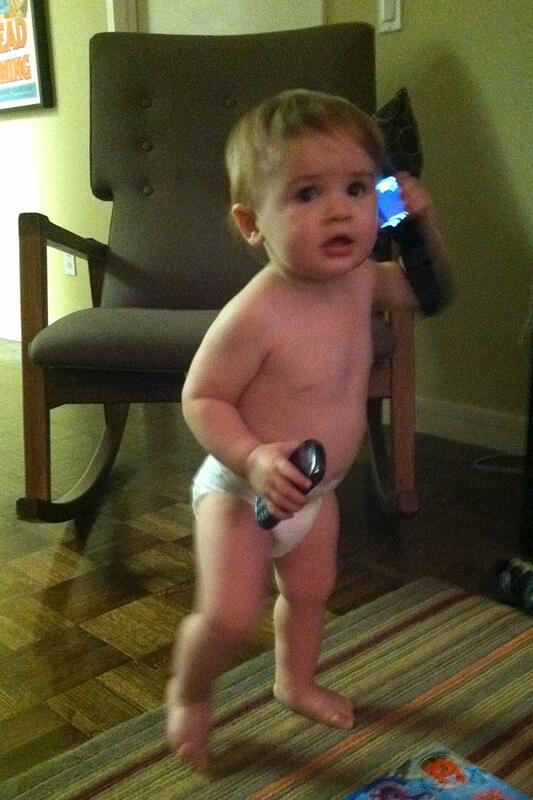 Jacqui and I recently upgraded our cell phones which means that Henry now gets to play with the old ones. Here’s a photo our friend Mimi took of him working both simultaneously to broker some important deals. Today we attended a Halloween-themed party in our neighborhood organized by the real estate company that manages our building. There was a pumpkin patch with carving and decorating stations, apple cider, snacks and music. Henry also publicly debuted his Halloween costume. Though one woman asked if he was an angry koala (? ), he’s actually a ferocious wolf. On a side note, I’m proposing that henceforth, an “Angry Koala” will be 2 oz Bundaberg rum, 1 oz Kahlua, 1 oz Coca-Cola and 1 oz light cream served over crushed ice. Henry flips through “Five Little Pumpkins”, his Halloween-themed book. Walking through the pumpkin patch. Since I have been recovering from a stress fracture in my foot and wearing a boot, Maryellen has been helping to get Henry up the stairs to daycare this week. Today, Henry took initiative and climbed all the way up himself. The stairs are pretty steep, so it was somewhat scary for me to see. I was also very proud and so was he. It is amazing to watch him get more confident and try something new every day. 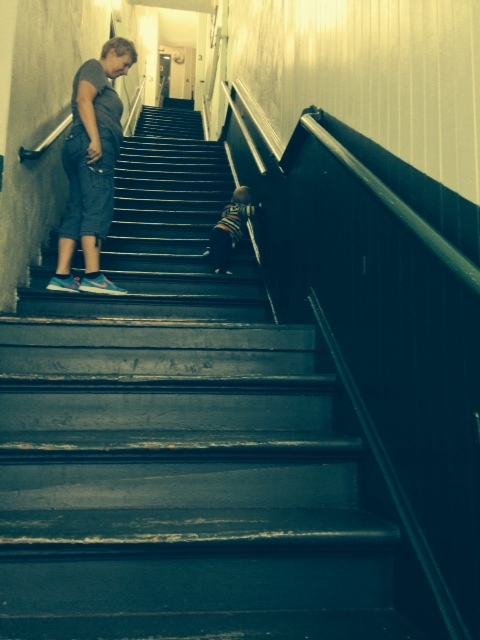 Henry climbs up the steep stairs to daycare.